Halo – a Greek word meaning salt – has been used for centuries for its health benefits. During a 45 minute session of halotherapy at The Salt Room Henderson, guests have the opportunity to experience the holistic health benefits of a salt cave. During treatment, a generator converts sodium chloride (salt) into an aerosolized form before it is pumped into the salt cave. As the salt is breathed in and is absorbed into the skin, its healing properties act as a natural anti-inflammatory and skin rejuvenator. You’ll exit the cave with your lungs feeling clean and your skin looking and feeling soft and refreshed. Massage therapy has been proven to promote general health and wellness, while improving a variety of conditions, including stress. The Salt Room Henderson offers a number of massage treatments, including Swedish Massage, Aromatherapy Deep Tissue Massage, Himalayan Hot Stone Massage, Sports Massage, and Couple’s Aromatherapy. Choose from 60 or 90 minute long massage sessions, depending on your level of pain and desire for treatment. Each massage treatment offers its own host of benefits. For example, the Swedish Massage relieves muscle tension while stimulating blood circulation. This massage ends with a session in the salt cave as your airways are cleansed and your body recovers. Rejuvenate your body with detoxifying skin treatments designed to improve your complexion by removing impurities from the skin. 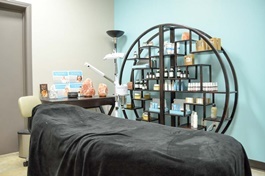 The Salt Room Henderson offers a body detox with anti-cellulite Dead Sea mud body wrap. The mud wrap is made with Dead Sea salt and has the power to penetrate deep into the pores to cleanse and detoxify the skin. You can also choose a Dead Sea mud back facial, an intensive mud treatment for the back designed to rid the back of acne and irritated skin. The detoxifying wrap is suitable for all skin types and will leave the body feeling cleansed. Yoga is an ancient practice with the power to heal the mind, body, and soul. At The Salt Room Henderson, you can sign up for select group classes held directly in the salt cave. Group classes include Halo-Yoga, Halo-Meditation, Halo-Mindfulness Meditation, and Halo-Conscious Dreaming – a shamanic journey led by voice and drum. Pranayama, or yogic breathing, spans for 75 minutes, Sivananda style hatha yoga is 90 minutes long, and yin yoga is 90 minutes of class for yogis at all levels, especially beginners. Each yoga class is open to all levels and no previous experience is needed. If you’re hosting a bachelorette party or girl’s night out, schedule an appointment for your group at The Salt Room Henderson in Nevada. The unique experience is the perfect outing for women of all ages and is the ideal way to prepare for an upcoming wedding by enhancing your health. Results from the treatment can vary from person to person but most guests feel the effects of the salt cave after the very first treatment. The Salt Room Spa can also be used as a preventative measure against common ailments like colds, coughs, and allergies. Make your appointment today.